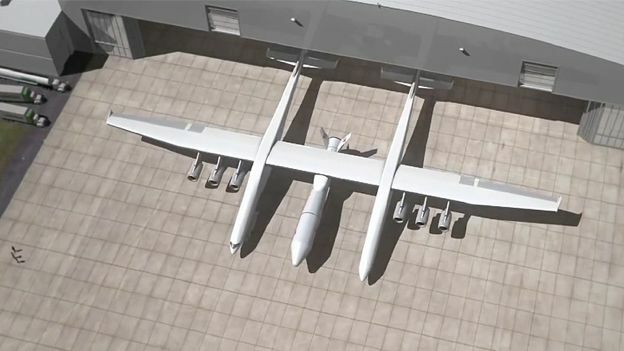 We've seen the Boeing 747 and Airbus A380 but both will pale in size when the Stratolaunch takes to the sky next year. The plane, which has been under construction at the Mojave Air and Space Port in California, is almost ready to undergo testing to see whether it can get into the Guinness Book of World Records at the same time as blasting satellites into near earth orbit. Stratolaunch, created by Scaled Composites, is the brainchild of Microsoft co-founder Paul Allen along with a star-studded list of partners that includes Elon Musk. It's unlikely you'll ever get to travel in the Stratolaunch because the main reason Scaled Composites is building the plane is to perform air launches of satellite carrying rockets that will presumably improve your viewing of forthcoming English Premier League seasons and vice versa. Launching rockets from crafts in the air is fast becoming the preferred method of getting satellites into space due to the fact that bad weather doesn't stunt launches and there's a potential to save energy as they don't need to blast off. Getting the plane off the ground will be quite the task. It has a gargantuan 385ft wing-span, which is 123ft wider than the Airbus A380 and needs 12,000ft of runway to take off. To put that into perspective, commercial airliners require around 7,000 to 8,000ft. Most people will still be wondering how they can get aboard…there are plans for space flights, so get saving!